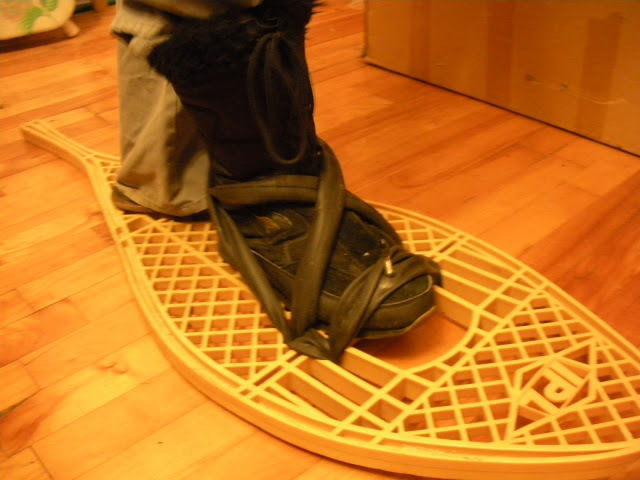 Home Blog Homemade snowshoe binding with a used bike inner tube! Homemade snowshoe binding with a used bike inner tube! Last Thursday, we tested out these homemade snowshoe bindings, which are environmentally friendly because they consist of a used bike inner tube! And they worked, much to my delight. I am rather proud of them because I came up with the idea and design myself! In addition to what you can see above, it’s good to loop the cross straps forward under the toe one more time, to prevent your foot from sliding forward and hitting the front of the snowshoe. One piece, no cutting of the inner tube required. I’ll have to add a more detailed and clear explanation! Many sincere thanks to our volunteer Rachel for her hours of hard work installing them and getting them just right with me back in December! Previous articleFaire de la raquette pour pratiquer son anglais et français! Next articleFriday afternoon snowshoe outing!